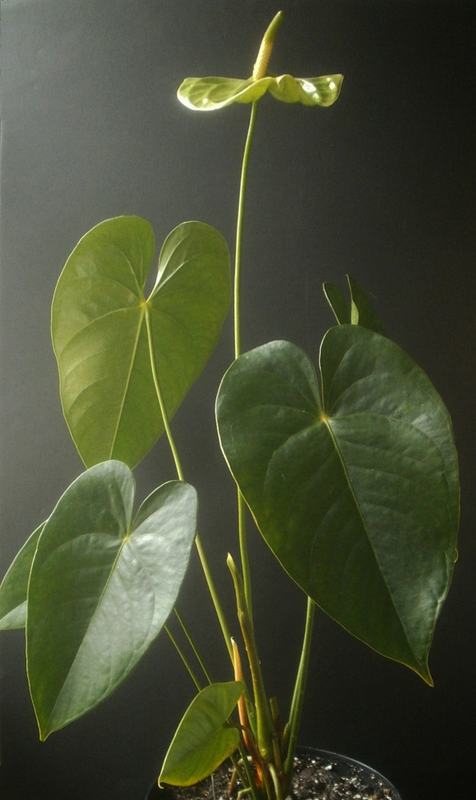 So, do you remember in the genetics post where I said that if anybody wanted to provide me with an Anthurium 'Midori' so I could pursue my dream of green- and brown-blooming Anthurium seedlings, they should feel free to do so? I'm not sure if the color is right or not. The first set of photos I took came out a lot more yellow than it seemed in real life, but I tried again on a different day and got basically the same thing, so maybe the pea-soup / algae-pond green is how it actually looks, and it's my brain that's getting it wrong. So far, everybody who's seen it in person (myself, husband, parents and two siblings) has had exactly the same reaction: an initial oh, hey, that's neat followed by a but . . . so that's all it does, though? That's a little weird. I don't know if I like that. 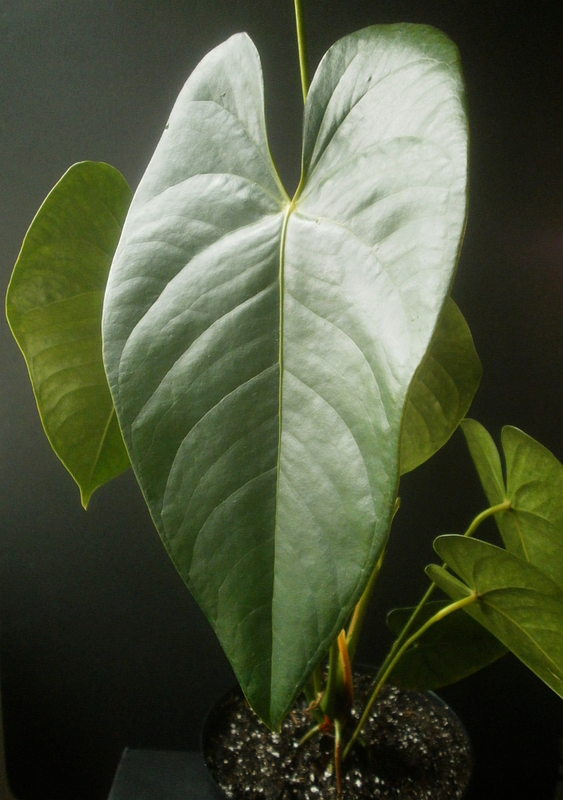 For anyone who might be interested, I ordered this from Aloha Hawaiian Flowers, which was the only place I could find online that sold whole 'Midori' plants, as opposed to cut flowers. No complaints about the company or the plant; I was a little irritated that the only shipping option I was given was 2-day FedEx, because that was expensive (as 2-day shipping would be for any two points separated by 3900 miles and half an ocean), but on the other hand, I got to choose the day it would arrive, it arrived when they said it would, and there was no damage to the plant from shipping, not even a creased leaf. So the shipping cost was arguably worth it. I did have to repot the plant when it arrived -- it had been potted in what I assume was black lava gravel, which I thought would probably not work as well indoors as it does outdoors in Hawaii. The plant has shown no sign of being traumatized by the shipping or repotting. And now, we begin the long wait for pollination, and everything that comes after pollination. 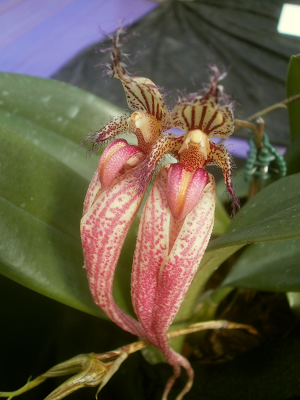 Best-case scenario, I'll have a 'Midori' cross blooming in January 2016 or so. 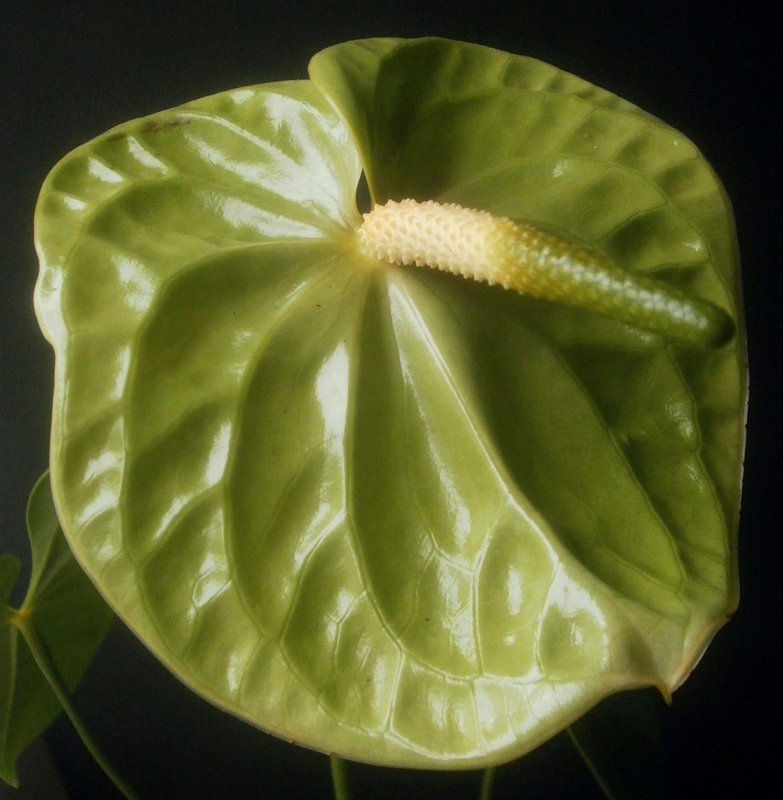 It is no longer possible to stretch the definition of "mid-June" to continue doing mid-June Anthurium seedling updates, but I still have stuff from the book to talk about, so. A lot of what's left falls into the category of "things I'd noticed myself, but it's nice to have the book confirm it for me anyway." Plus there are a few things I could have noticed if I had been paying closer attention, but only became certain about after taking regular photographs of all the blooms over a period of a couple months. For example, spadices move over time. 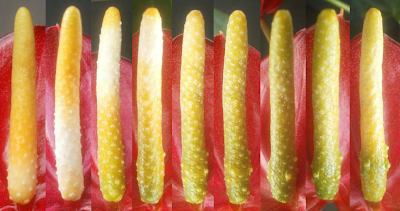 When the spathe first opens, the spadix will be lying more or less parallel to it, but as time passes, the spadix becomes more, um, let's call it "perpendicular," to the spathe. We'll let #097 "Colin Ambulance" demonstrate this. NOID Anthurium spotted at Wallace's, during the orchid show in March. I'd guess that the one on the left is the older of the two. When Anthurium spathes first open, the spadices are usually a uniform color. (If the spathe is red, the spadix is usually yellow, occasionally green; if the spathe is pink, the spadix is usually pink.) As the inflorescence ages, a different color, usually white (for red spathes) or lavender (for pink spathes) appears at the base and moves toward the tip. A third color sometimes appears after that, again moving from base to tip. That's usually brown, but I've also seen red and green. This doesn't have a lot of consequences for me, but it might save me time; I at least don't have to worry about trying to pollinate blooms that are clearly signaling that they're done. It also might help me to get 'Florida' pollinated sometime, since it seems from this that most of the times I've attempted to pollinate it, it hasn't actually been accepting pollen. 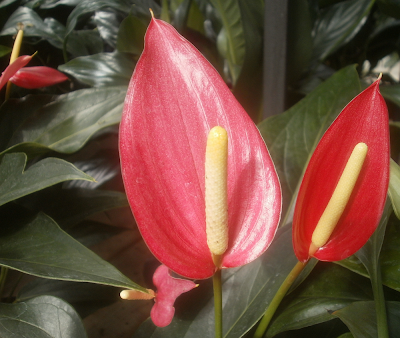 There are several more Anthurium-related items to share, which I will get to in time. By the time I'm done with those, there will be even more first-time blooms to show you. (#144 "Graham Reaper" is so pretty, you guys.) And then some more buds will have been produced, and so on and so forth. 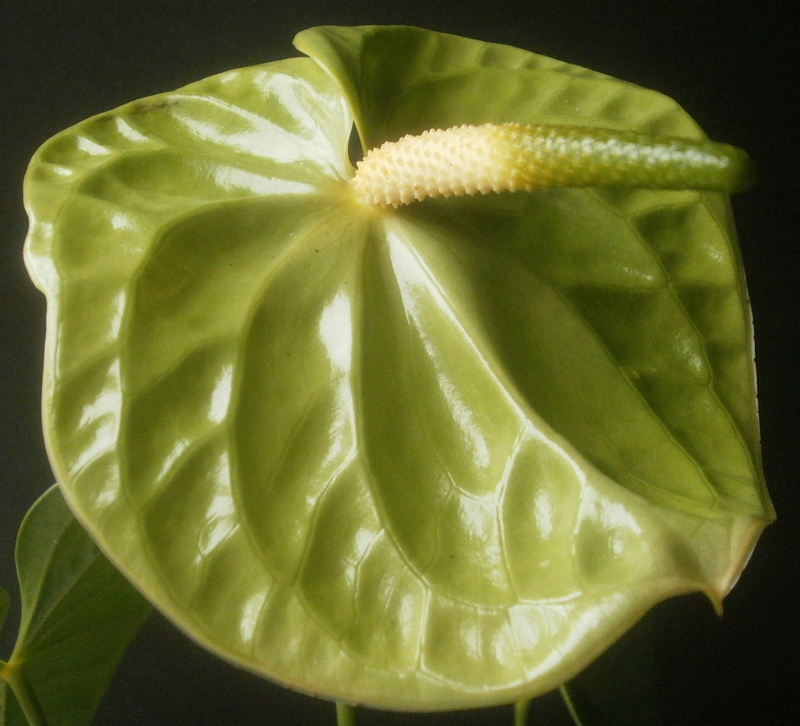 So if you've been thinking, what I really want to read on PATSP this summer is lots of Anthurium-related posts, I have good news! 1 There's some variation because the lighting isn't 100% uniform from one photo session to the next. I've been taking these pictures in the same location, during more or less the same time of day, with the same camera, but the cloudiness varies, and my camera's auto-correct color is a bit of a problem too. So it's not perfect, but it's good enough for you to be able to see what I'm talking about. The brown tip that appears between May 30 and Jun 18 is the result of it being too close to one of the fluorescent bulbs; it wouldn't have done that had I not accidentally burned it. 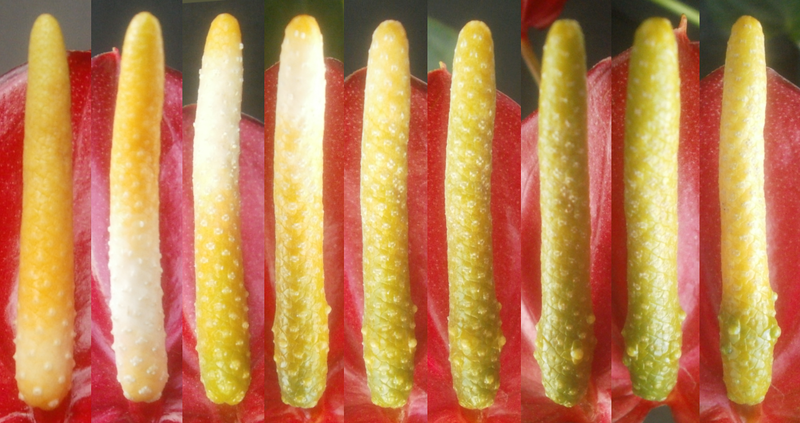 Also, these photos may exaggerate the amount of color change, since the last two seem to have more light reflecting off the spathe than the first three. I try to keep reflections minimal, but it often doesn't work. 3 As the man said, you can see a lot by just looking. What Mr. Berra neglects to mention is how time-consuming looking can be sometimes. 4 I would have tried this with one of the pink/pink blooms, but they tend to have very perpendicular spadices, so I don't usually have consistent in-focus photos of them.